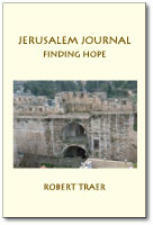 Title: Jerusalem Journal: Finding Hope Author: Robert Traer A PenMark Press Book soft cover 254 pp. illustrated USD 20.00 ISBN 978-1888570892 2006 The davies Group, Publishers These personal reflections on religious life and conflict in Israel and the occupied West Bank were written during February through May, 2005, while the author was in Jerusalem to support Jewish Israelis, Muslim Palestinians, and Christians working for a just peace. The author traveled on the West Bank with members of Rabbis for Human Rights to help protect Palestinian farmers and children from attacks by Jewish settlers. He went behind the Separation Wall to talk with Palestinian advocates for human rights. The author visited the Western Wall below the Temple Mount where Jews pray, the Haram al-Sharif where Muslims pray, and he celebrated Easter in Catholic, Orthodox and Protestant services in the Old City of Jerusalem. He also visited archeological sites in Galilee, Caesarea, Acre, and the Jordan Valley. The author relates his interviews with rabbis and the Jewish arguments supporting justice for Palestinians. This book offers the author’s reflections on the long history of Jews, Christians and Muslims living in their land. Despite the violence and cynicism that now mark the conflict in the Middle East, the author finds hope in the courage and faith of Jews, Christians and Muslims he met in Jerusalem and in the occupied West Bank. Contents Introduction Alternative Tourism The Old City;Greater Jerusalem; Holy Places; Restoring the Old City; Visit to Acre; Water in the Desert; Visit to Galilee; Yad Vashem Religious Celebrations Palm Sunday in Jerusalem; Easter and Purim; Sunday Mosaic; Orthodox Easter EAPPI Visits Planting Trees Near Bethlehem; At Rachel’s Tomb; “Freedom School” in Abu Dis; Back to Abu Dis; Journey to Jayyous; Fearing Evil in the Valley; Stones of Hebron West Bank Interventions Rabbis for Human Rights; Men With Guns; Right and Wrong; In the Olive Groves Again Religious Views Transforming Difficult Texts; Kiddush HaShem: Sanctifying God’s Name; Finding Hope; Christians and Muslims in Jerusalem; Telling the Truth Secular Views Visiting Mishmar Ha’emek Kibbutz; The Golan for Development; New Historian Ilan Pappe; Israeli Women for Peace; Working for Reconciliation; Machsom Watch; Redefining Security Conclusions Talking Points: Israel/Palestine; Talking Points: Religion; Land (f )or Peace; Resisting Terrorism and Occupation Author Dr. Robert Traer(PhD, Graduate Theological Union, Berkeley; DMn, University of Chicago Divinity School) served as executive director of the International Association for Religious Freedom from 1990-2000 and represented the work of the IARF on religious freedom at the United Nations. (The IARF is an interfaith organization involving Buddhists, Christians, Hindus, Jews, Muslims, Sikhs, Shinto priests, members of indigenous traditions, Unitarians and Universalists.) In 2002 Dr. Traer was a Resident Scholar at the Tantur Ecumenical Institute for Theological Studies in Israel, and in the spring of 2005 he served with the World Council of Churches’ Ecumenical Accompaniment Program in Palestine and Israel. He is a retired minister in the Presbyterian Church (USA). Dr. Traer has taught courses on ethics and religion at the Dominican University of California in San Rafael. He is the author of Doing Environmental Ethics, Faith in Human Rights, Quest for Truth: Critical Reflections on Interfaith Cooperation, and Jerusalem Journal: Finding Hope. Many of his writings are available online.